Wampfler Energy Supply Systems are designed for safety, ease of installation, flexibility and minimal maintenance requirements. They are available in Single Pole, Multi Pole, Enclosed Rail and Inductive Power Configurations. As a leading provider of mobile electrification systems, Crane Controls supply the full range of Wampfler's products including cable reels, conductor bar, festoon cables, etc. The Wampfler 812 Conductor rail system offers a modern power supply solution using individual, single-pole insulated conductor rails. Typical applications for 812 include traveling cranes, loading bridges, container traffic and people mover systems. 812 systems can be installed in either indoor outdoor environments. For up to 140 Amp applications, the conductor rail is fabricated from steel. Aluminum with stainless inserts is used for 200 Amp and 320 Amp systems and Copper is available for 250 Amp and 400 Amp applications. Conductor rails can be installed vertically or horizontally, straight or curved. 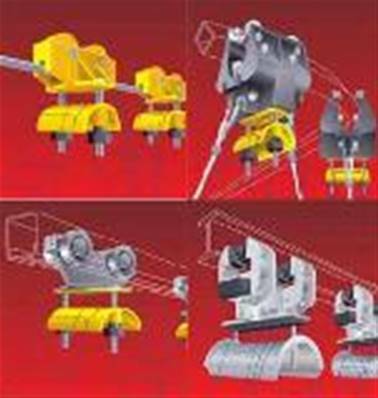 The spring operated collectors can accommodate vertical or horizontal misalignment and are available in single or double shoe versions. 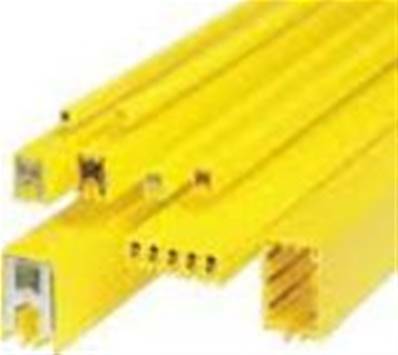 We also stock the full range of INSUL-8 Conductor Bar, along with Duct-o-Wire Electrification Systems & SAF T BAR.